Brilliant ornamental cherry that forms an upright, tall but compact habit. Covered with elegant, shell-pink, incredibly beautiful cherry blossom throughout spring. Perfect for anyone who wants the benefits of one of these majestic trees but has limited space. Will grow to approx. 4.5m (16ft) in 10 years. Fully winter Hardy. Imagine sitting in your garden this spring, basking in the afternoon sun and surrounded by incredibly beautiful cherry blossom. 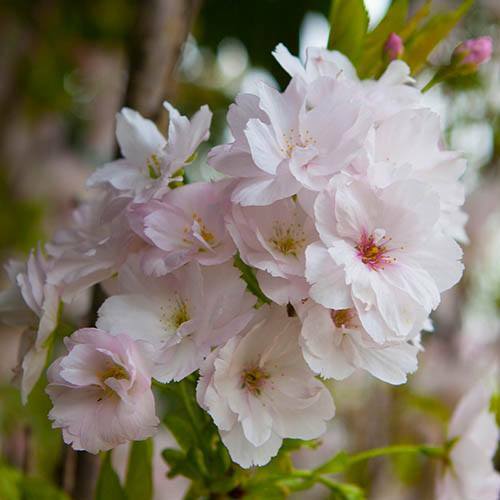 Amanogawa is a delightful flowering cherry which is literally covered in elegant, shell-pink flowers throughout spring. It is very similar to other flowering cherries such as Kanzan, however it grows in an upright fashion forming a very compact, tall habit making it perfect for anyone who wants the benefits of one of these truly majestic trees but has limited space. Supplied as a freshly lifted bare root tree approx. 1-1.2m tall.